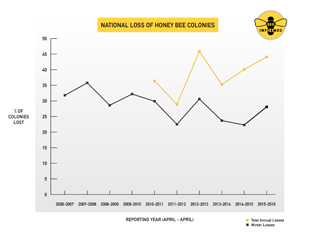 Beekeepers across the United States lost 44 percent of their honey bee colonies during the year spanning April 2015 to April 2016, according to the latest preliminary results of an annual nationwide survey. Rates of both winter loss and summer loss—and consequently, total annual losses—worsened compared with last year. This marks the second consecutive survey year that summer loss rates rivaled winter loss rates. 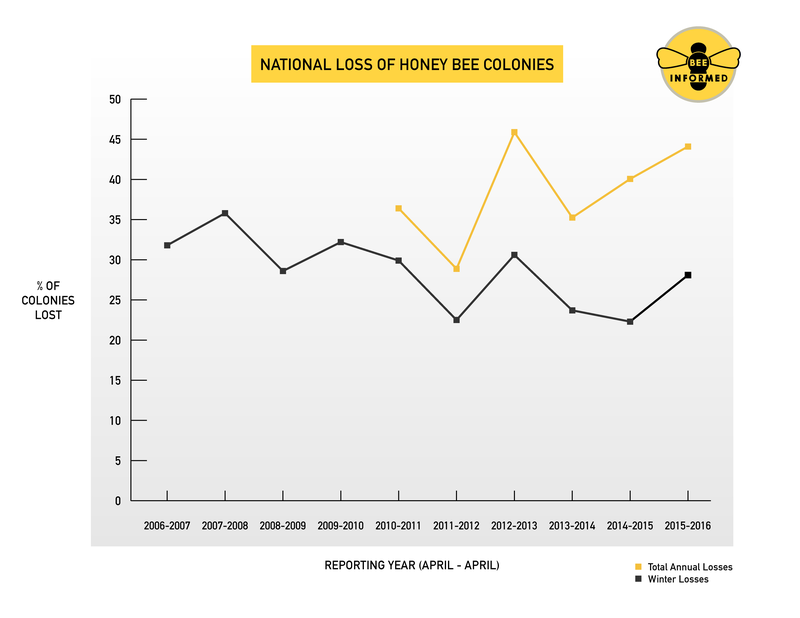 Beekeepers who responded to the survey lost a total of 44.1 percent of their colonies over the course of the year. This marks an increase of 3.5 percent over the previous study year (2014-15), when loss rates were found to be 40.6 percent. Winter loss rates increased from 22.3 percent in the previous winter to 28.1 percent this past winter, while summer loss rates increased from 25.3 percent to 28.1 percent. The researchers note that many factors are contributing to colony losses. A clear culprit is the varroa mite, a lethal parasite that can easily spread between colonies. Pesticides and malnutrition caused by changing land use patterns are also likely taking a toll, especially among commercial beekeepers. A recent study, published online in the journal Apidologie on April 20, 2016, provided the first multi-year assessment of honey bee parasites and disease in both commercial and backyard beekeeping operations. Among other findings (summarized in a recent University of Maryland press release), that study found that the varroa mite is far more abundant than previous estimates indicate and is closely linked to several damaging viruses. Varroa is a particularly challenging problem among backyard beekeepers (defined as those who manage fewer than 50 colonies). This is the tenth year of the winter loss survey, and the sixth year to include summer and annual losses in addition to winter loss data. More than 5,700 beekeepers from 48 states responded to this year’s survey. All told, these beekeepers are responsible for about 15 percent of the nation’s estimated 2.66 million managed honey bee colonies. The survey is part of a larger research effort to understand why honey bee colonies are in such poor health, and what can be done to manage the situation. Some crops, such as almonds, depend entirely on honey bees for pollination. Estimates of the total economic value of honey bee pollination services range between $10 billion and $15 billion annually. A summary of the 2015-2016 survey results is available upon request prior to May 10, 2016; thereafter the results will be added to previous years’ results publicly available on the Bee Informed Partnership’s website.